Quiet a few Greek islands have their own little airport. Most of them are quite small. The only flights from these airports are local ones to Athens for example. Some of the bigger islands have international airports though. Most of them cater charter flight from different European countries. From the UK for example you can directly to Crete, Rhodes and others. Scheduled flights are a different story. They will normally stop in Athens where you have to change airplanes. If you can avoid them. It's a waste of time. The national airline Olympic Airways connects all local airports with Athens. Greece provides more ferry connections than any other country in Europe. A few hundred islands depend on supplies delivered from the mainland. The islands west of the mainland get their deliveries from smaller ports along the coast. 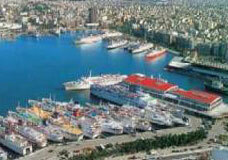 To most other islands the ferries leave from Piraeus or Thessaloniki. Bigger islands like Crete or Corfu receive several deliveries a day, smaller ones only once week. Fairs got up a lot in recent years but they are still reasonable. A fairly typical price for a ticket to an island that is 3 to 4 hours away would be about 10 Euro. You can buy them at the port or any travel agency. Students can apply for a discount. Ferries are hardly ever booked out. In high season it might be a good idea to buy your tickets a couple of days in advance. If you travel to Greece by car it is a good idea to take the boat from Italy (Venice, Trieste, Ancona, Bari or Brindisi). In theory you could drive all the way but this is a tough and potentially dangerous trip. If you decide to take the ferry from Italy you should book well in advance. There are very few trains on the mainland and none on the islands. Public transport is done by bus. The public busses are fast, cheap and reliable. In most places they are even punctual. The system is far superior to most European countries. 100 kilometres on a bus cost about 8 Euro. In bigger cities there will be a bus terminal where you can buy tickets. In small villages just wait for the bus. You can then buy a ticket on the bus. They normally have a driver and a conductor. Overland busses are prepared to carry luggage. They have plenty of storage room and often also deliver mail and parcels. Outside of villages you can just wait at the side of the road and wave the bus. It will pick you up. There are no toilets on the bus and they are none smoking. Apparently the no-smoking policy doesn't apply to the driver. I sometimes get the impression it is compulsory for Greek drivers to constantly smoke while driving. Many of the islands are quite hilly and with very little traffic. For that reason they are popular with cyclists. Even professional teams come here to practise. Team Telekom for example is known to come to Crete every spring and prepare for the new season. Especially Crete is quite popular with cyclists since it is having a few thousand kilometres of road stretching from long flat parts to quite difficult legs through the high mountains. Until a few years ago, donkeys were quite popular. You'll still see quite a few of them but these days only old people would use them for transportation. They are still handy when it comes to difficult terrain. Very popular are taxis. Compare to northern Europe they are dirt cheap. 100 kilometres would cost about 60 Europe. Of course the fares are different when you use a taxi within a city but even then they are relatively cheap. Especially in places like Athens I would insist on them switching on the meter. It doesn't happen naturally. Greeks don't like to pay taxes and they'll always try to avoid them. In most places you can rent cars and bikes. There is no point to do this from home. Most of the time you get a better deal when you just walk in to a rental place. It is a good idea to pay for the insurance. Especially with rental bikes there is a good chance that the rental place will rip you off should you really have an accident and no insurance. Hitchhiking is easy and not particularly dangerous, well at least once you get used to their driving style. Traffic rules are slightly different there. Greeks don't care about speed limits, double lines or rights of way. A good horn on the other hand is very important.